Mumbai, Aug 17 (IANS) The key Indian equity indices traded on a flat-to-positive note during the mid-afternoon trade session on Thursday, as healthy buying in metal, oil and gas, and IT stocks kept investors’ sentiments buoyed. However, market observers opined that a mixed trend observed in the global markets, coupled with profit booking in automobile and banking stocks, pared gains. The Nifty50 of the National Stock Exchange (NSE) traded above the psychologically important 9,900-level. At 12.45 p.m., it rose by 26.55 points or 0.27 per cent to trade at 9,923.85 points. The 30-scrip Sensitive Index (Sensex) of the BSE, which opened at 31,919.17 points, traded at 31,834.45 points — up 63.56 points, or 0.20 per cent, from its previous close at 31,770.89 points. 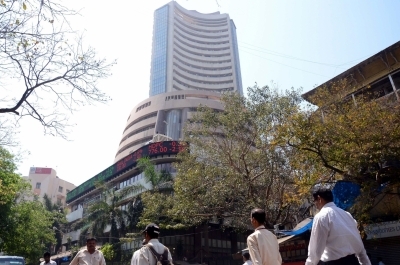 The Sensex has so far touched a high of 31,937.51 points and a low of 31,714.10 points during the intra-day trade. The BSE market breadth was bullish with 1,430 advances and 963 declines. “Indian equity benchmarks climbed during the morning session, following gains in Asian peers, after the US Federal Reserve meeting minutes reduced the odds of another interest rate increase this year. Infosys was the top gainer on both the indices after saying its board will consider a proposal to buy back shares,” Dhruv Desai, Director and Chief Operating Officer of Tradebulls, told IANS. “Top gainers on the NSE were Infosys,Vedanta and Bank of Baroda, while the top three losers were Hindustan Unilever, Zee Entertainment and Asian Paints,” he added. On Wednesday, the benchmark indices continued with their second consecutive session of gains to close on a higher note as healthy buying was witnessed in index heavyweights such as ITC, HDFC, Tata Motors and Hindustan Unilever (HUL), among others. The Nifty50 closed higher by 103.15 points or 1.05 per cent at 9,897.30 points, while the Sensex closed at 31,770.89 points — up 321.86 points, or 1.02 per cent.